On October 27, 2018, His Holiness Patriarch Mor Ignatius Aphrem II attended a reception held in his honor by Mr. Munzir Nazha, at his house in London, United Kingdom. 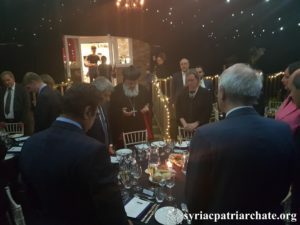 The reception was attended by their Eminences: Mor Timotheos Moussa Al-Shamani, Archbishop of the Archdiocese of Mor Mattai Monastery, Mor Athanasius Touma Dakkama, Patriarchal Vicar in the United Kingdom, and Mor Timotheos Matta Al-Khoury, Patriarchal Vicar in the Patriarchal Archdiocese of Damascus. Very Rev. Fr. Patrick, Director of Barnabas Fund, in addition to several members of the house of Lords, and academic and public figures also attended the reception.